Julie Goodnight talks about the three ‘wings’ in her barn and explains the regime for her youngest horsesIn the small town where I live, we have a large school complex with three different buildings - the elementary, the middle school and the high school, each with a specific program designed to meet the particular needs of each age group. In my barn, we have the same type of divisions to help us better meet the needs of the horses we have in three different stages of life. The elementary wing of our barn is for the youngest horses. These are our up-and-coming horses that we think have great potential but have not yet earned the same status as their upper classmates. We want the best for these horses but they also need to learn to toughen up and play by the rules. So just like in elementary school, structure, discipline, work ethic and manners are most important. The most prominent section in my barn is for my prime-time horses - the mature, fully trained working horses. They get the highest level of care and the most luxurious accommodations because they work for a living. These are my working horses - partners in my business - and they get the very best we have to offer. In a quiet corner of the facility is our geriatric wing, currently occupied with two stately old mares who will soon be starting their fourth decades of life. We do what we can for these elders, to make their final stage of life as comfortable as possible. They’ve given so much, to so many riders over the years and I am happy to give them a noble and comfortable, albeit expensive, retirement. In this three-part series, I'd like to share with you the horses that occupy each section of my barn, the behaviours we expect from that age group, how we focus our training, how we keep them fit and the specific health and nutritional needs of each age group. We'll start at the beginning with the youngsters. The YoungstersWe don't breed any horses, so the youngest horses in my barn tend to be three to six years old. Currently I have two adolescents - Eddie, who is four, and Doc, who is six. I bought Eddie as a three year old; he is a well-bred Quarter Horse by a World Champion versatility ranch horse stallion and I have big plans for him in the years to come. Doc is a great little ranch horse and he's fun to have around for our friends to ride and for when we need a spare horse. I tend to buy more horses in this age group than I keep. I like having nice horses coming along but often I find a good match for them and then take great delight in selling them and buying another. But every now and then a young horse comes along that is really special and has the potential to grow into a prime-time horse for me. My youngsters are still in the primary training stages and my hope is that one day Eddie will be a replacement for my number one horse, Dually. Behave Your Age Horses in this age group are a lot like adolescent humans - they can be cocky, challenge authority and test their boundaries. At one moment they seem all grown up but the next they are acting like a baby. Younger horses often have more bravery and curiosity than they should, which is a good thing, and I like to encourage these behaviours so that they learn to be confident in new situations. The youngsters are much more playful and energetic than their older barn mates, so they need lots of turnout time with horses that like to play and rough-house. To me, it's important that the youngsters also hang out some with the more mature horses when they are working, so they learn how to act appropriately in different situations. Training Focus At this stage, we spend a lot of time working on the basics: good ground manners, tying patiently, trailering and basic manoeuvres under saddle. We do a lot of ground work with these horses to refine their manners, teach them to be focused on their handler and wait patiently for directives. I call this kindergarten for horses. You don't go to kindergarten to learn algebra; you go to kindergarten to learn how to sit at your desk, raise your hand when you want to talk and walk in a single-file line. We want our young horses to learn to stand still when asked, focus on the task at hand, ground tie, respect boundaries and not act impulsively. Our youngsters will spend a lot of time standing tied at the hitching rail or trailer, alone or in company - learning patience. We like to ride them out in the open and expose them to novel stimuli as much as possible. We feed them in the trailer often so they learn to like it. 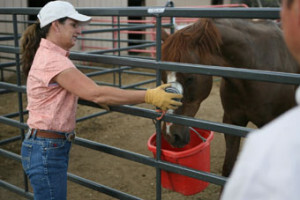 We spend a lot of time getting them used to ropes, opening gates from horseback, dragging logs, walking over tarps, etc. It's really important that young horses develop a strong work ethic. At this stage of training our young horses will get some long hard rides and have many wet saddle blankets. They'll learn to work by themselves, well away from any other horses; and they'll learn to work in a crowd of strange horses, maintaining good manners. While we are working steadily to increase the horse's skill level under saddle at this stage, it is also very important to give them as many different experiences as we can and to make sure those early experiences are very positive. I'll take them to clinics and expos when I can, just to get them on the road, let them learn to sleep in a strange barn and work in strange environments. The more travelling and unique experiences they have at this age the more settled they will be later in life. Fitness Although horses grow the fastest in their first two years of life, they continue to mature, both physically and mentally until they are seven or eight years old. In their adolescence, we want to make sure our horses grow strong and get fit, but without excessive damage to their joints. After the age of four, you can do just about anything with a horse, but younger than that we avoid lots of circling and hard manoeuvres like jumping. We never take a horse younger than four to the mountains. These horses need lots of work, not only to grow strong and fit but also to develop a work ethic. They may get worked four to six times a week depending on the length and exertion of the ride. Part of the goals of their workouts will be to advance their skills by learning new cues and more difficult manoeuvres. Part of their workout will be repetition of the basics to develop muscle memory and coordination. Health and NutritionOur young horses get a high quality diet of alfalfa/grass mixed hay, as well as whole oats. While they are still growing and filling out, we pump a fair amount of food in to them to keep them in good flesh. In addition to growing, they are also worked pretty hard so their calorie demand is high. The young horses pretty much get all the hay they can eat, plus oats and supplements twice a day. I start our young horses on joint supplements as soon as they are working under saddle. Although we think of these for helping older horses that already have cartilage breakdown, the ingredients are scientifically formulated to support and maintain the health of your horse’s joints. In my mind, the sooner they are started on a joint supplement the healthier their joints will be in mid-life. Our young horses also get a vitamin and mineral supplement that supports healthy hoof growth. This is really important with the additional stress of carrying a rider and working hard. The youngsters in my barn are most important for the potential they represent. We want to nurture and develop them in order to turn them into the best horses they can be so that one day they might fill the shoes of our prime-time horses. Are Horse Starting Competitions Ethical?